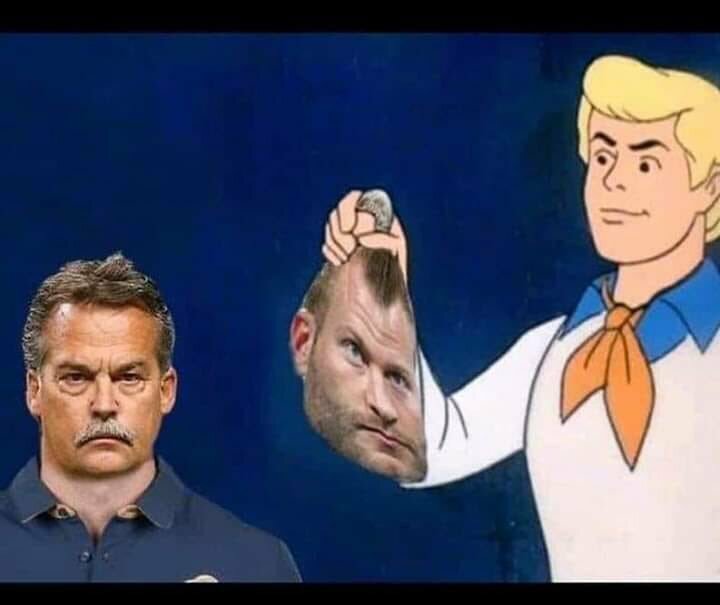 Well Fisher would have never done so well on D.
Actually I thought a Gruden face under the mask would have been more relevant given his poor scheming, play calling and lack of adjustments in the game. It was frustrating to watch but even more devastating to review the film & analyze. As good as a coach as McVay is, he has a ways to go in "strategic response." In game adjustments are key as are ways to make sure defense doesn't get a key on what you're trying to do (Eagles threw everything at Pats in SB LII). "McVay didn't adjust his offense to attack NE weaknesses"
What are those weaknesses, and what tools did the Rams have to exploit them? Exactly! The second half they did adjust but it was a matter of tendency breakers more than anything. They stopped running on first and second down. The main thing that failed was play action, NE was ready for it every time with deep safety help. And NE held the ball so long it didn’t give the Rams much chance to adjust. Also, what's the 'narrative' if Banks holds onto that dime Goff tosses late to 'answer' the game's only TD and tie the game at 10 in the final moments? If that happens, and it was damned close to happening, and the final kick by the Pats to make it 13-10 wins the game, aren't people talking about the greatest defensive gem in SB History (for both clubs)? Sure, McVay has some growth ahead of him. And look out when he does. My biggest issue was not understanding - if Gurley truly isn't injured - why he wasn't the focal point of McVay's game plan, running and passing? I think I'll never understand why if Gurley wasn't made lame by his late December knee injury. So why didn't he run more 12 personnel all game given the Pats struggled with it all year? Because 11 is what the Rams are*. No team used it more in 2018 (90% of plays) than the Rams. It's the old Gibbs thing - a simple offense using the same player grouping and a pretty limited suite of plays, but using multiple formations and shifts to attempt to disguise what's coming. It's straightforward, it's what they did all year, it's what got them to the SB, and they run it and force opponents to try and stop it. Whether McVay should have changed what they do for that game is moot, he had to give his scheme an honest shot in that game against the best opponent. Now he's learned that he can't necessarily do that and he needs to go back to the drawing board and add some more. But I can't fault him for for wanting to go with what he felt was his best chance and with the formation in which he had the most faith, in his approach to that game. Agreed - except I remain mystified by Gurley’s limited usage and touches. Darned dumb - unless Todd was truly a shadow of himself. Former Skin OCs Kyle Shanahan and Sean McVay now have each lost Super Bowls to the Patriots in the last few years by abandoning the stud running backs that got them there. Whether McVay should have changed what they do for that game is moot, he had to give his scheme an honest shot in that game against the best opponent. Now he's learned that he can't necessarily do that and he needs to go back to the drawing board and add some more. But I can't fault him for for wanting to go with what he felt was his best chance and the formation he had them most faith, in his approach to that game. I saw a report saying the Gurley will not need knee surgery this offseason. But that indicates to me that the knee is still troublesome and that is probably why he was used so sparingly the last few games and was largely ineffective when he was in. Something was obviously up with Gurley, that's for sure. Agree about the Gurley question...surprised I haven't read more about the issue(s) there. Still think that one of the answers for the Lambs was to play more hurry up offense...as that seemed to work when they used it. Of course...the risk is that your D is out on the field even sooner than if the O takes their time. The Pats are not invincible even in SB's. To me, though, a key was whatever adjustment was made in the second half by the Pats O as Brady was not under the same duress as he was in the first half. And the Lambs never really cracked the code to limit the MVP. And....the Pats made the plays. The Lambs had their shots but Banks could not come down with the big catch, or Goff missed the big throw. They have 1 more year with Goff on his rookie deal, after that either he becomes elite or they have a big decision on their hands. One of the biggest decisions are before that..........do they pick up his 5th year option? That decision has to be made by May 3. One of the biggest decisions are before that......do they pick up his 5th year option? That decision has to be made by May 3. No way I pay him $20m. But does that make him a lame duck and sour things? One of the biggest decisions are before that....do they pick up his 5th year option? That decision has to be made by May 3. I think they will. They won't let one game sway their opinion on the 5th year option. Its guaranteed for injury only until March 2020 and they have the opportunity to trade him if he doesn't meet expectations in 2019. Remember the guy threw for nearly 4,700 yards, 32 TDs/12 ints and 65% comp rate and an adj QBR of 66.4...and thats with his RB's getting 350 touches and 1700 yards on the ground. I'd have him here over Smith anyday and twice on Sundays. Trade him to Minny for Cousins. They don't have the cap room. I wonder if that thought has entered McVay's head? I would imagine that they will let Goff play out his rookie deal...including 5th year. Then make a decision. Minny may be willing to make a deal if they do not reach at least the playoffs next season. Heck, with KC it was supposed to be a SB berth....not sitting at home watching the festivities with the rest of us. As soon as Sean got the job we should have offered a straight swap, was the best time for a trade for both us and KC. C'est la vie. And the Pats were one of the better defences against 11 formations. So do you back yourself to beat that defense or do you make preparations to adjust? Noting that good defences generally win the battles over good offenses when well matched against each other, I know which way I would have gone and it's not charging head on in a frontal assault. Sure open with it by all means, but by end of qtr 1 that game plan should have been abandoned for plan B. Smart coaches plan and practice contingencies and then are prepared to change tact when needed. Battle plans rarely survive contact with the enemy. The prepared commander allows for all possible contingencies. McVay proved to be neither smart nor prepared. I'm not sure that going with something that you haven't done and you weren't really built for, against that defense, was the answer either. Teams win Superbowls by continuing to do what got them there, not changing everything up for that one game. Belicheck changed his entire defensive scheme for the SB. He ran a defense they hadn't run all season, just to counter the Rams' prolific offense. He out-coached Sean completely. From your article: "Patriots players knew to expect two weeks of intensive study. Belichick does not use a set system. He has a basic set of fundamental tenets, but he alters strategy weekly based on his opponent’s features and flaws." I don't get "he changed his entire defensive system" out of that. Look, I haven't disagreed that Belichik out-coached McVay. I'm just saying that overhauling an offense in two weeks is not as easy as you guys are inferring. 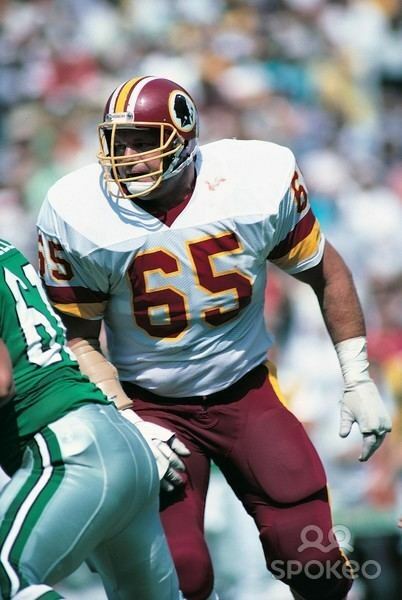 Belichik had the advantage of having the same thing that the SB Skins used to have - a brilliant defensive coach and smart, veteran players who could thrive in any scheme. It's a lot easier to be flexible with that than with offense. Tell me this: if Belichik is so flexible and adaptable, how come his offense got pretty much shut down? How come Brady et all didn't just start doing something else and blow away the Rams defense? It's not that easy to change offense. And for all this talk and everyone getting gushy about Belichik and his masterpiece, one slightly different outcome on a deep throw to the end zone would have changed all that and we wouldn't be having this conversation. Or that the Rams did a similar excellent coaching job on the Pats Defense. I assume you mean Pat's offense. Sure, but again, we are talking about doing something different on offense, not defense. The argument is that McVay didn't change up his offense somehow in response to (or even in anticipation of) what the Pats were doing, and I think that's far easier to say than to do. And especially so in the light of Riggo Drill's posted article which indicates that the Pats really don;t employ a predictable defensive scheme in order to counter anything an opponent can do. So McVay could either try to come up with something exotic in two weeks, or work on what got them there and hope it's enough. True - a point I made above, many days ago. Not taking anything away from the brilliant - and lethal - combo of Brady and Belichick. But once more I saw Wade Phillips, a guy Jay passed over as a prospective DC to hire Joe Barry instead in 2016 (just incredible, but par for the course in the Bruce Allen era), give Tom Brady and the Pats' offense absolute fits in a Final 4 game (as he did when Denver defeated the Pats in the AFC Title game to allow them to go on and win their last Super Bowl following the '15 regular season). "Belichick surprised the Rams by starting in zone defense after playing man-to-man all season. He produced havoc by changing the role of an unheralded defensive back. He unleashed a torrent of different pass rushes despite barely blitzing. He did nothing the Rams expected and everything to specially stifle a high-powered attack."